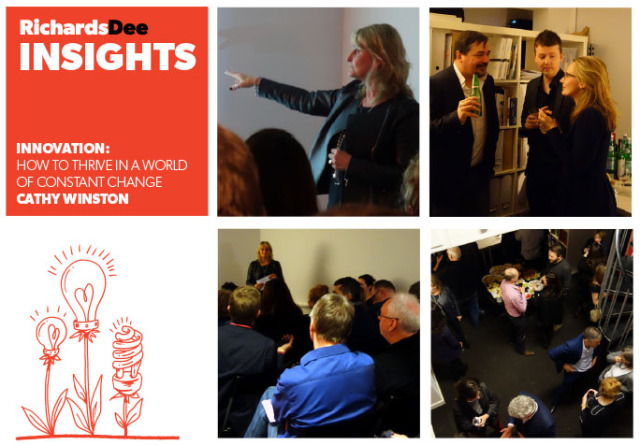 LastThursday evening, we were delighted to be joined by over fifty clients and colleagues at our studio, where Cathy Winston inspired and educated us in the process of Innovation. Black hats, yellow hats, start-up monopoly and cafe conversations, it was a night of creativity, ideas and new thinking – helping us improve our businesses and brands through embracing innovation. This was our third Insights evenings, where we invite leaders, creatives and like minded individuals to share their passions and insights in an informal and sociable setting. The aim of the evenings are to encourage a shared learning environment where we can be inspired and empowered. We were delighted with the amount of interest with our latest talk and would like to thank everyone for attending, we are now considering speakers for our next Insights evening which will be soon, and if you are interested in being invited to the next Insights evening then please drop us a note.